With the failures of the Kyoto Protocol and Canada’s decision to back out in 2011, we continue to play a limited role in global conversations. The popular Fossil of the Day awards dedicated a special “Lifetime Unachievement Award” to our nation. It’s funny because my interest in climate change sparked back when Canada was being heralded as a pioneer in the environmental movement in early 2000 (which could also be disputed, but I was much younger then). 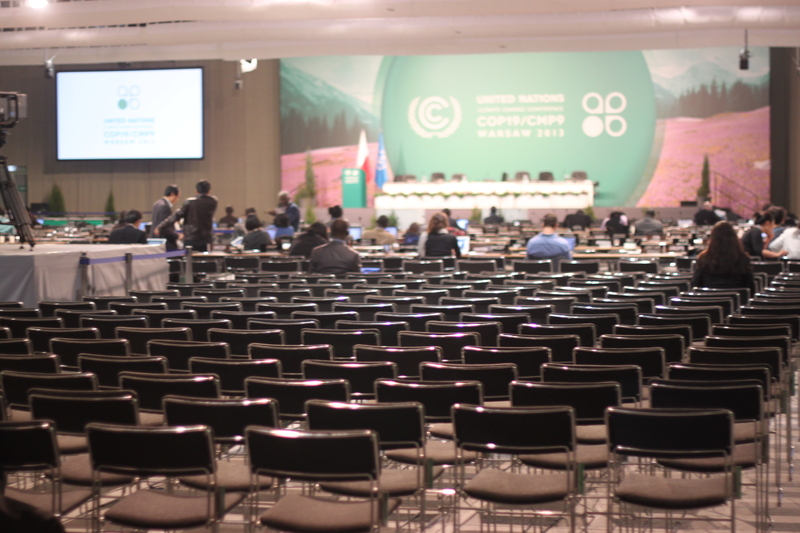 It has been somewhat gratifying to, at least, have the opportunity to engage with the Canadian negotiating team at COP19 but limited public participation is not satisfying when the scope of influence is extremely limited, if not non-existent. The recent Emissions Trends report by Environment Canada demonstrates a gap in even managing to reach our 2020 GHG emissions targets; current trajectory of federal environmental policies and plans paint an unclear picture on how we intend to cover the difference while maintaining rigorous oil sands development. There is no dispute anymore - climate change is real. Authors of IPCC reports continued to echo the real threats and impacts of climate change in the coming decades at COP19. The real problem now is not a lack of science; we know the impacts and we can see the effects manifesting in unpredictable damages worldwide. Climate change is now & always has been a political issue. I keep coming back to an article I read at my resource management class by Ludwig, Hilborn, & Walters where they propose that “we shall never attain scientific consensus concerning the systems that are being exploited.” The Policy Forum paper is from 1993 when I was just a year old. They conclude that effective management should include the following principles: Act before scientific consensus is achieved, rely on scientists to recognize problems but not remedy them, distrust claims of sustainability, & confront uncertainty. So, the excuse to act before knowing every single fact should not be accepted because of the dynamic natures of these challenges. How far have we come between 1993 (a year after the first Rio Earth Summit) & now? During my flight back from Poland when my brain adamantly persisted the invitation to sleep, I began to try processing the events that took place last week. I felt somewhat embarrassed asking for crayons from the flight attendant passing by as she was giving them out to kids a few rows ahead but I couldn’t resist. But you can never be too old for crayons, right? Here’s a snapshot of how I visualized COP19. Despite all the failures, the real heroes continue to be the civil society groups, NGOs, and experts working in this field to continue to push the global platform towards meaningful change. Only reason why I may have not come out as upset as others may be because I decided to take a journalistic approach and really invest my time in conversations with as many people as possible. The consensus I came to is that most are aware of the same challenges and share the same frustrations I am feeling but many continue to push for change from the inside of the walls rather than the outside. Equally, I am inspired by the #Volveremos (we will be back) walk-out who are leading the charge in building the grassroots movement and building the capacity for citizens to demand change from their government leaders. I will be sharing my thoughts more eloquently soon but till then, what do you think of the visual? I was hoping that it might be a good way for people to come up with questions if some image or note fancies your interest & I could answer them. Do let me know! How do we reform our current model for these negotiations? How can we work towards the necessary roadmap for the 2015 climate agreement? Questions I will be investigating & I welcome your involvement in this journey. I finally want to give sincere appreciation to the University of Waterloo Coalition for Sustainable Development (UWCSD) and my friends in it (both home and conference delegates) who have mobilized this initiative so effortlessly! In addition, the support provided by the University of Waterloo and its Environmental Faculty alongside Climate Action Network (CAN-RAC) has made this experiential learning experience impactful for me (can’t say the same for the actual outcomes). Check out Elizabeth’s May last blog for a great summary of the results from the conference. 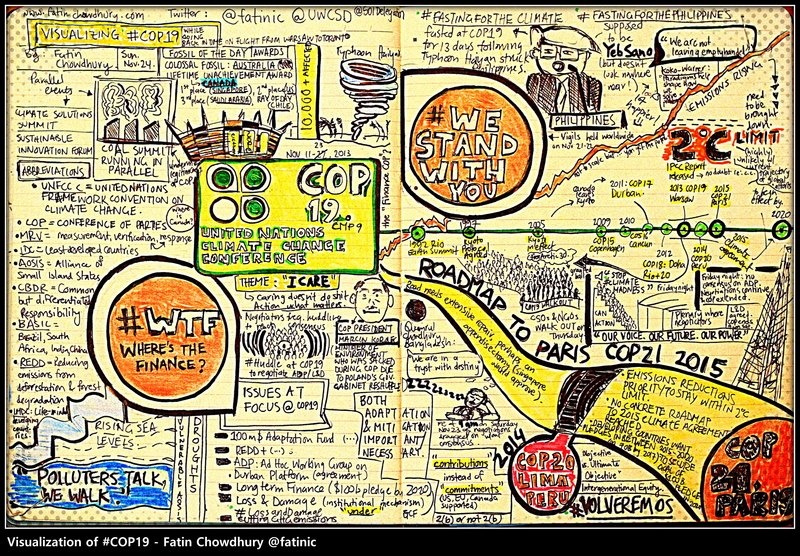 I also want to thank all those on social media and groups including AdoptaNegotiator, theVerb, RTCC EarthinBrackets, SustainUS, YOUNGO, and all youth delegations who’s brilliant coverage made it easy to stay on top of the chaos that was COP19. I hadn’t intended this to be really a blog post but getting in this headspace gets me too riled up!